In the time it takes you to read the first paragraph, there will be one marijuana arrest. What’s a prohibition without excessive arrests? Ever since the Marihuana Tax Act of 1937, the failed prohibition on cannabis has resulted in many arrests that have increased for centuries. Despite the sensible policy changes occurring throughout the U.S., marijuana arrests are still prevalent and even make up most of the annual drug arrests by law enforcement. 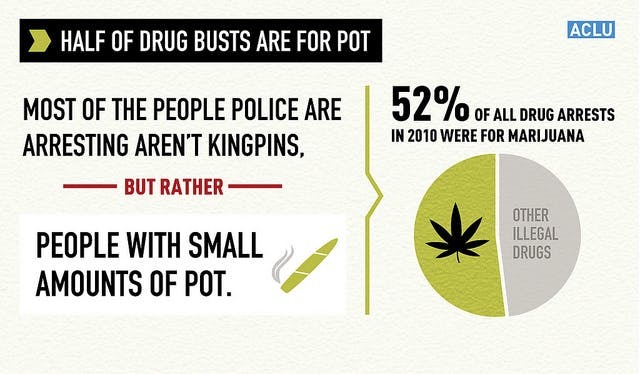 In fact, of all the drug arrests in 2010, 52% of them were for marijuana-related charges. The War on Drugs in general has caused many nonviolent drug arrests throughout the United States, which has populated the prison system immensely – giving America the highest incarceration rate in the world. To put it in perspective, the U.S. only contains about 5% of the world’s population, but yet we house 25% of the world’s prisoners. Out of the more than 2 million people in our nation’s prisons and jail cells, over 500,000 are drug offenders. Of course there are plenty of arrests that are for serious charges, but there have been extreme spikes for nonviolent drug arrests. For instance, in 2013, there were 1.5 million people arrested on nonviolent drug charges in the U.S. alone. How many of those were for marijuana law violations? 693,482. That’s 88% of all nonviolent drug charges that year. Think about that. 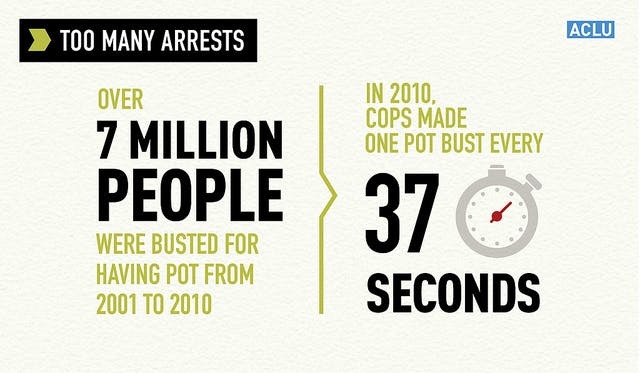 Another statistic to think about is that there have been 8.2 million marijuana arrests between 2001 and 2010. But that’s not what we should focus on. What we should focus on is that 88% of these marijuana arrests were for just having cannabis in their possession. 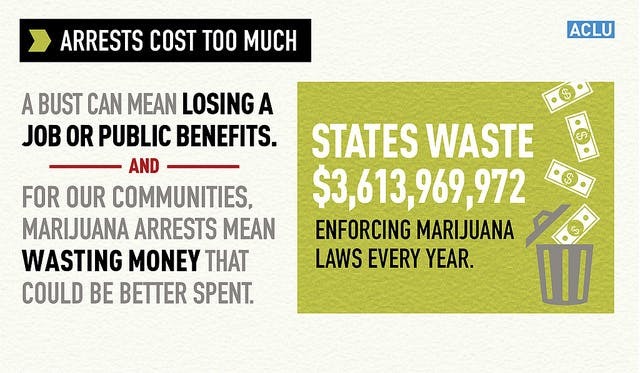 Marijuana arrests have become second nature to law enforcement, as cops were making one marijuana arrest every 42 seconds in the U.S. in 2011. Instead of diverting their services to serious crime, police unfortunately have continued to promote cannabis prohibition. A huge problem that cannabis prohibition has brought on is the fact that a majority of marijuana arrests have a racial connection to it. Even though Caucasians and African Americans have about the same usage rate for consuming cannabis, there is a hefty imbalance of those who get away with it, and those who don’t. Compared to Caucasians, it has been found that African Americans are four times more likely to be arrested for marijuana possession. Four times. 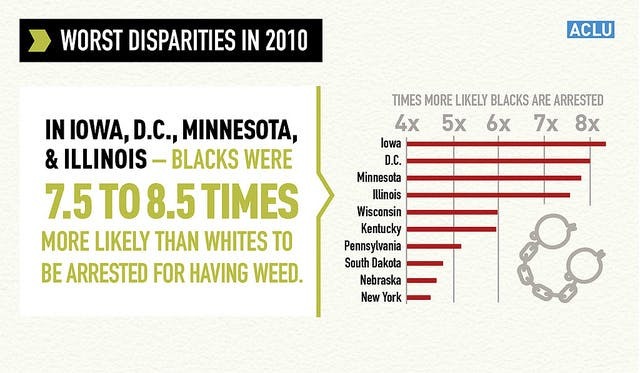 However, for Washington D.C., Iowa, Minnesota and Illinois, it is even worse as African Americans are 7.5 to 8.5 times more likely to be arrested for marijuana possession. It is for that very reason that Washington D.C. passed decriminalization this past year in hopes of crushing any discriminating arrests in the District. As more and more states start to implement decriminalization legislation, these acts of unequal punishments will begin to even out (we hope). If the acknowledgement of the failure of the War on Drugs continues to increase among society, sensible policy changes will be enacted and will help our arrest and incarceration problems extensively. More specifically, cannabis prohibition will inevitably end as cannabis reform is going from state-to-state. These sensible policy changes will help tremendously to protect individuals who choose to consume the plant medically or recreationally. With criminal penalties instead of civil fines, you are at risk of losing your employment, education, family, housing, etc. For one example, there have been over 200,000 students who have lost federal financial aid eligibility because of a drug conviction. Even though there is a ways to go until the end of prohibition, it is clear that the acceptance of decriminalization legislation is growing. New York is just one recent example that exemplifies a new sensible policy drastically reducing nonviolent cannabis arrests that endanger families and individuals. Within just two weeks of implementing a new policy to not arrest most individuals possessing 25 grams or less of cannabis, Mayor Bill de Blasio stated that low-level marijuana arrests were down more than 60 percent, which in turn will divert law enforcement services to more serious crimes. If other states continue the domino affect, it shall have a positive impact on a majority of nonviolent drug arrests and/or incarcerations across the nation. 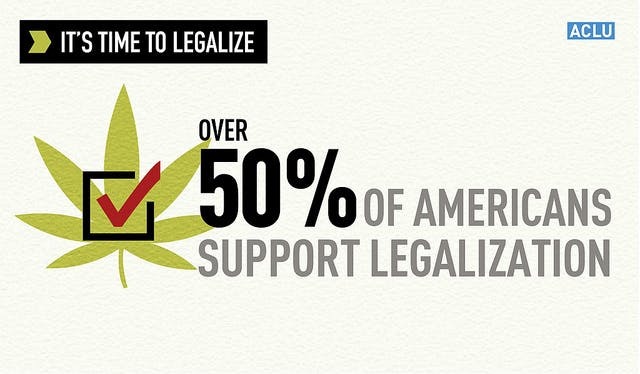 What is your opinion on decriminalization laws and their impact in America? Where do you think we are heading in the near future? Oh, and by the way, if it were 2011, there would be 5 people arrested for marijuana possession after you finished reading this short article.